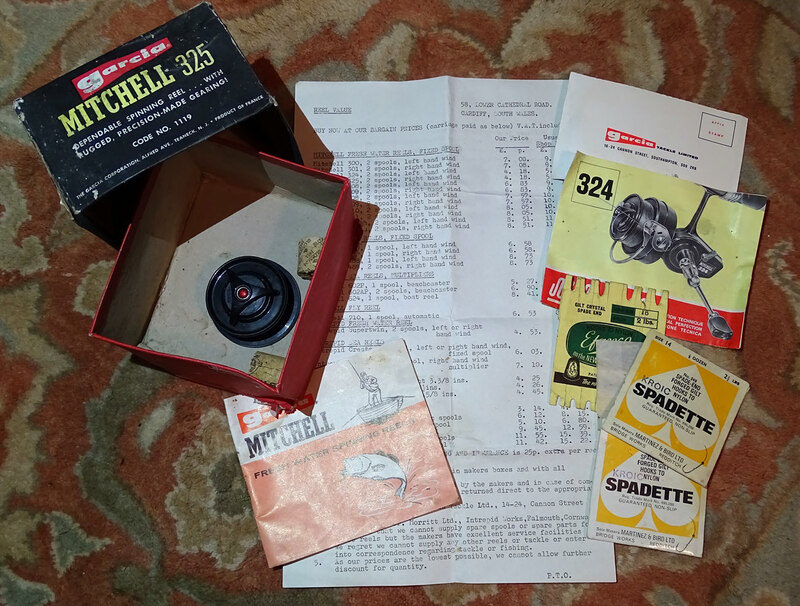 I picked up an old Mitchell 325 reel box for a £1 from a car boot sale yesterday. 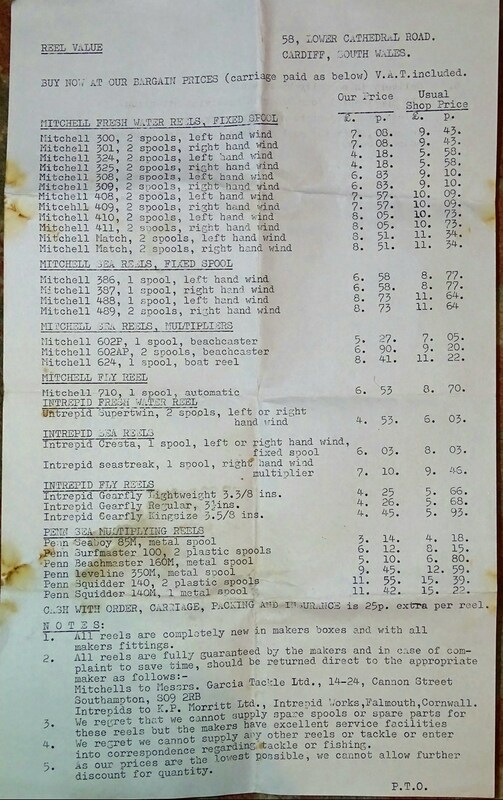 Inside was a few bits including this typed price list for Mitchell, Intrepid and Penn reels, "Shop prices"and "Our prices". At the top left of the page is what I assume is the company name "REEL VALUE". Has and anybody dealt with or heard of them. I have attached 3 images below of the price list, hope they are readable. I have a 1975 Angling Times and the prices are about £3.00 dearer, so I would probably put the price list just after decimalisation about mid 1971- 72 possibly 73. Google maps 'Street level' now show the address as a flat with 58 clearly at the top of the door, with a possibility of a shop either side of the door. 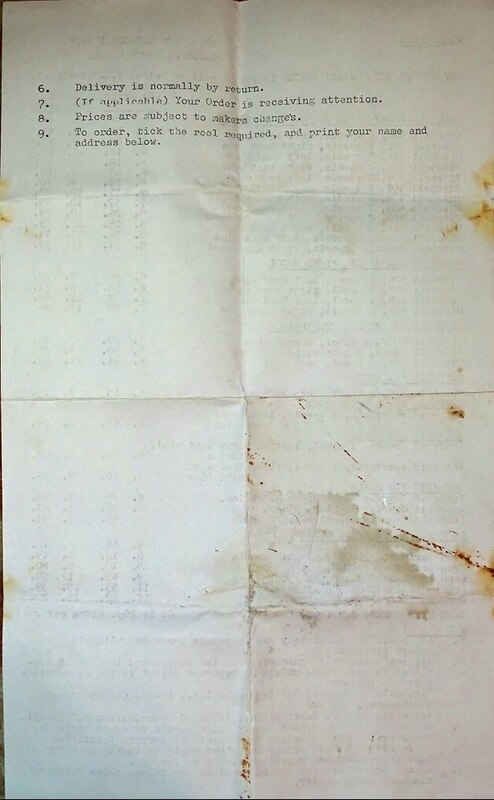 I have been in touch with John Wordsworth of Reel Value.co.uk and he said that he doesn't recall in the company's history trading from the said address at the top of the document, (at this moment in time). Blimey £11+ for a Penn squidder! they were always a well respected reel but a lot of money back then. As VAT is added it is after 1973. Purchase Tax was used prior. Interesting reading Reedling. I love finding little suprises. Oh! and a spare spool too for the 324. Thank you Olly. So it seems to be after April 1st 1973. Last edited by Tonytoned on Sun Sep 09, 2018 4:20 pm, edited 1 time in total. Thank you Beresford the calculator is a bit of fun. It's quite a shock to see what prices it comes up with. I tried basing it on 1971, not at that time realising this list is post 1973. I fished today and the club secretary was around when I caught a pretty linear scaled mirror, he looked at my gear as asked if I was using a Mitchell Match. I replied that it's a very much improved 300. I know the Match was/is an iconic reel – I was given one for my 21st but would you now pay £84 for a new one, if they were still made? I guess so. That is amazing when you put it like that. I had a Mitchell Match. I think it cost about £25.00 possibly a little less from my mum's club book, which I paid £1.25 weekly from a paper round, which did back in about 1976/77.